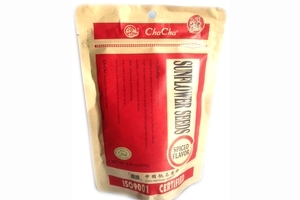 Cha Cha Sunflower Seeds, Roasted & Salted with Spiced Flavor in 8.04oz (228g) Pack. The Chacha sunflower seeds, picking the selected large and plump full sunflower seeds from the natural inner Mongolian environmental-friendly stuffed with traditional herbal flavor, after steaming and roasting, the crispy tasty seeds for sure bring you the happiness of delicious feeling. The Cha Cha Snacks, Delightful Taste! Product of China. ISO 9001 Certified. Halal Certified. Awesome. If you love sunflower seeds, you should give these a try. The flavoring on them is very hard to describe, and the seeds are just massive.